where dissenting ideas and opinions are heard and respected – in areas including current market trends, opportunities, and threats; competitors and collaborators; brand positioning; product and/or service offering extensions and innovations; and strategic partnership, investment, and M&A opportunities, among others. With their counsel, you will more effectively determine how best to leverage your company’s brand, consumer offering, varied assets, and team in ways that serve the local market well, strengthen your competitive positioning, and maximize both financial and strategic return. Connector. Every organization’s success depends greatly on the caliber, integrity, and performance of its people. If you want your company to succeed in China – where there’s a lack of qualified candidates, attrition rates are high, and cross-border team building is challenging to get right – it is essential to hire a strong, independently-minded country manager and experienced local team and provide them with the needed encouragement, support, and resources to thrive. To this end, your China brain trust should assist by sourcing and evaluating candidates for key roles and, for selected high performers, serve as informal mentors to develop, motivate, and retain such talent. Collaborator. 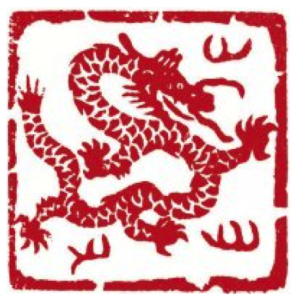 Those invited to join your China brain trust should have the ability and relationships to secure favorable terms with good local vendors, as needed, and an entrepreneurial mindset and “ears to the ground,” actively sharing, cultivating, and helping to negotiate strategic partnership, investment, and M&A opportunities as they arise. Depending upon the level of commitment and contribution of each advisor, he or she should be compensated fairly and well and, perhaps, given a chance to assume an even larger role within your overall global enterprise such as helping to open up other emerging markets. Creating a road map for China’s future prosperity through calculated experimentation, economic reform, and the embrace of practical solutions, Deng Xiaoping (1904-1997) once popularized the saying that China should “cross the river by feeling the stones.” The same is as true today for those enterprises seeking to successful navigate the choppy and uncertain waters of China’s complex, fast-growing market. 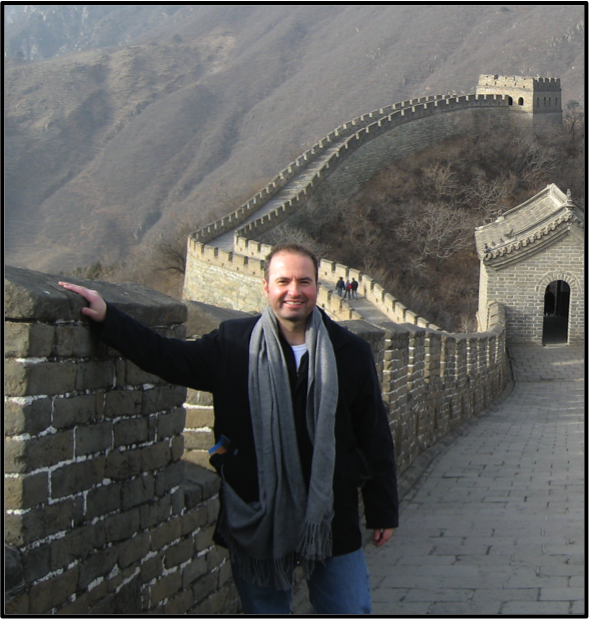 Rather than diving into the deep end alone, implement a more thoughtful cross-border strategy and maintain a strong China brain trust by your side and the journey ahead will undoubtedly be much less daunting and highly rewarding for both you and your enterprise. 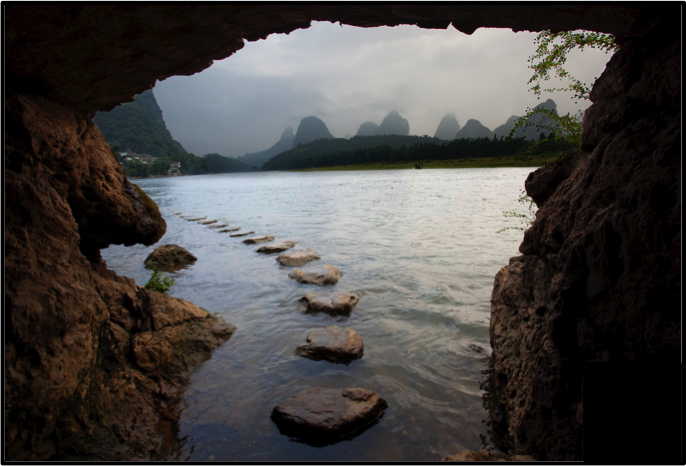 Image: Photograph of the stepping stone pathway on the Li River in southern China by M&M Photo Tours. As the world’s second largest economy with a massive, increasingly sophisticated consumer base spending heavily both at home and abroad, China represents a tremendous opportunity for companies seeking growth. But the path to profits is highly complex, fraught with potential pitfalls that are best avoided and lessons learned from others who, typically, enter the market unfocused, unprepared and, ultimately, pay a heavy price in missed opportunities and wasted resources. There is a more practical approach that, if followed, will mitigate many inherent risks and greatly increase one’s chances of success in China today. Before allocating significant effort, resources, and time to launch or ramp up growth of their businesses in China, executives should first seek to gain a deeper appreciation of the competitive landscape, market dynamics, and local talent pool and better understand consumer habits, unmet needs, and willingness-to-pay as they might apply to their own company’s products and/or service offerings. One of the most effective ways of gathering such relevant, targeted market intelligence and making educated, timely business decisions to better position the enterprise for success is by first establishing a small China brain trust. non-traditional approaches will, likely, better overcome obstacles and lead to the most promising outcomes. In an era of economic globalization, interconnectedness, and interdependence, where China often represents their second largest and fastest-growing market with the greatest potential investment return, most companies still stubbornly operate in the outdated, rigid mindset of “deliberate” strategic development. Employing proven tactics from their developed markets typically prevails over a more agile, flexible approach based on real-time knowledge and guidance from reliable, on-the-ground sources. Inevitable challenges due to language barriers, cultural sensitivities, the need to instill shared corporate values, and communication hurtles caused by physical distance to headquarters further complicate matters. In launching or building your business in China’s complex, rapidly changing market, therefore, it is wise to form your own China brain trust of locally-based, engaged, and trustworthy individuals with a relevant track record of performance and put them to their best and highest use. 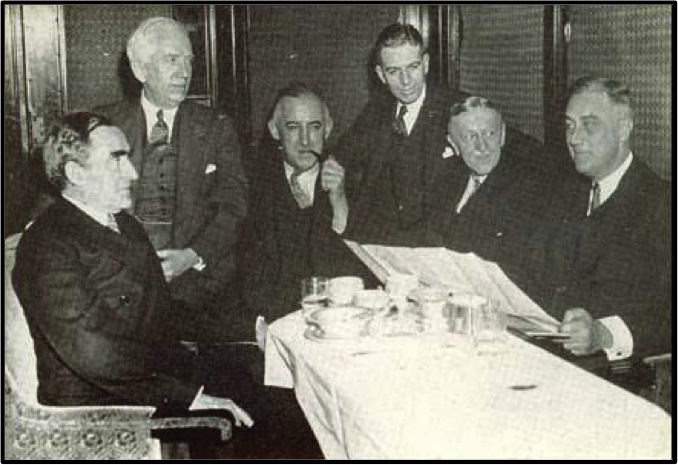 In business, it is widely acknowledged that those companies best positioned to capitalize on their own sources of leverage – financial, human, and strategic – are typically the ones able to achieve profitability and scale the fastest and overcome obstacles with the greatest ease and flexibility relative to their competitors. Leveraging your company’s global assets, talent pool, and institutional knowledge will increase the chances that the business thrives and prospers in China; it is equally important, however, to remember that this is also a valuable, often untapped, two-way street. The China business can and should be positioned as a “growth engine” for your overall global enterprise. On the talent front, providing growth opportunities for your most promising local executives to apply what they have learned in helping to lead other initiatives and business units across the entire enterprise will likely keep them more deeply engaged and motivated, continuing to contribute as outperforming, productive members of your extended team. Experience teaches that compensation comes in many forms – not merely financial reward – and that such career development opportunities and increased responsibilities within the organization are typically two effective motivators for high-achieving executives. This is particularly relevant when seeking to attract the most qualified talent to lead your business in highly competitive markets where the local playing fields always seem to be somewhat tilted in favor of the domestic players, whether deserving or not. Honing your company’s ability to overcome external constraints and the inevitable obstacles along the way should make it more agile, pro-active, and sensitive to the market, its challenges, and opportunities. Further, customizing your company’s content, product, or service to the China market will inevitably create more efficient ways of getting things done internally and form new strategic relationships that may be capitalized on in other geographies and, perhaps, related industry sectors as your business grows and diversifies over time. 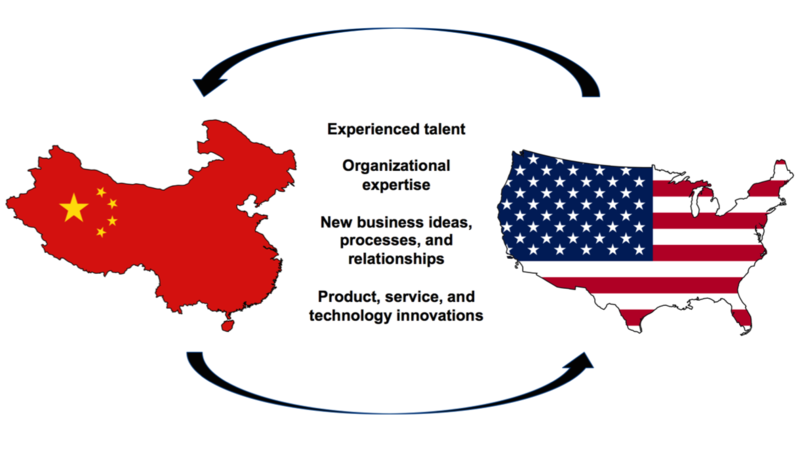 With an open mindset and the right systems in place to capitalize on this two-way street, your China business will not only be accretive to your company’s top and bottom lines, but will serve as a critical strategic engine to drive growth for your global enterprise in an increasingly global marketplace. Image: Fire Dragon Enterprises LLC, 2013. Many companies – including those with world-class brands and a wealth of international experience – still enter China with a seemingly half-hearted commitment to the new venture and naivety that often underestimates the complexities of the marketplace; needed capital, human, and institutional resources; and required time frame for their businesses to achieve a reasonable amount of financial and strategic success. It is crucial to have at least one executive champion of the China initiative at company headquarters with the credibility, enthusiasm, and political capital to help nurture and support the company’s China business, particularly in the early years as it strives to achieve proof of concept and establish its own independence. Choosing a qualified individual for the on-the-ground leadership role, one who can serve as an effective bridge to headquarters and shares the company’s cultural values and overall vision, is also of critical importance. In the interim, however, until talent with a good mix of sector expertise, engagement level, and suitable temperament is brought on board to manage the local business, it may be necessary to employ a trusted interim General Manager who understands your sector and the China market well, can commit to leading the China business unit through its infancy, and, ultimately, is willing and capable of “letting go” after finding and engaging his or her own replacement to build the local business through subsequent stages of growth and maturity. One of the major inherent weaknesses of the current China market is a shortage of qualified talent, so selecting, training, and retaining a strong on-the-ground team will undoubtedly be an ongoing challenge for those championing the cause of the local business in China. a holding pattern or, worse yet, pulling out of the market “for the time being” not only sends terrible signals with long-lasting repercussions, but likely negates any positive ground secured to date and opportunities for a leading, meaningful competitive positioning in the market going forward. 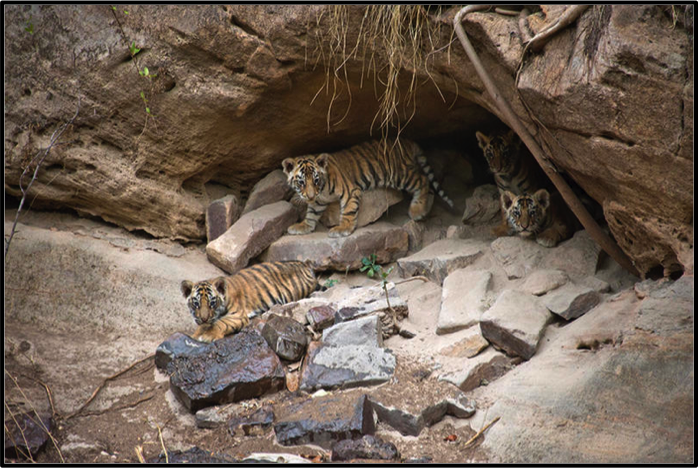 Image: Photograph by award-winning wildlife photographer Suzi Eszterhas for DiscoverWildlife.com. modernization initiatives, in general, can all trace their roots back to this tragic period in recent Chinese history. In dealing with the Chinese, it is important to acknowledge and respect such sentiments likely brewing beneath the surface in interactions with business partners, competitors, and government officials, among others, and overcome the typically heightened sense of suspicion of the intentions of foreign businesses as merely seeking financial gain at the expense of local customers and companies. On a more practical level, there are many fundamental differences in Eastern and Western approaches to problem solving, negotiating styles, and general ways of thinking that, if ignored, can, at best, hinder a company’s potential growth opportunities and, at worst, completely derail a company’s business in China. For example, Western culture prides itself on the importance of individualism, informal relationships, egalitarianism, and the Rule of Law whereas Eastern culture and, more specifically, the Chinese hold in higher regard a strong belief in collectivism, formal relationships, hierarchies, and the Rule of Man – although the last point is more a facet of the Party-State dynamic in Modern China than the actual will of the people. 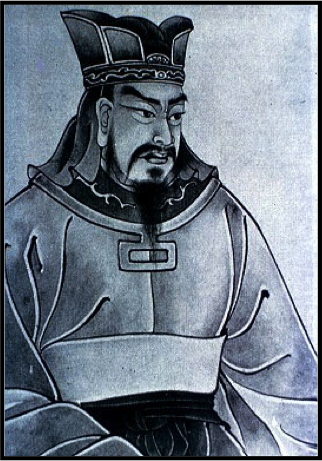 In addition, Western-minded and trained executives value the need to manage expectations well and seek a win-win outcome in business dealings whereas Chinese executives operate in an environment that appreciates the importance of guan xi (guān xi, 关系), meaning connections or relationships, and mian zi (miàn zi, 面子), meaning face, as in saving face. Those companies conducting “business as usual” in China – at least as they might in a more developed Western market – who ignore or undervalue these fundamental, long-standing cultural sensitivities, do so at their own peril. 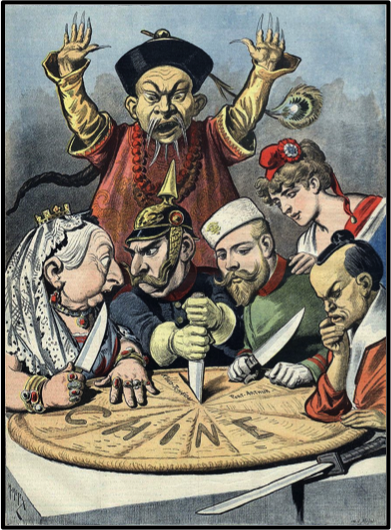 Image: En Chine – Le Gâteau des Rois et… des Empereurs (China – the Cake of Kings and… of Emperors), French political cartoon, 1898. For many thousands of years in its earlier recorded history, China was an inwardly-focused nation, largely closed off to and wary of foreigners – a long period of time during which the Chinese, an extraordinarily creative and industrious people, achieved greatness in many fields. The Silk Road trading route allowed interaction with foreigners and an exchange of culture and goods, although these were fairly controlled exchanges; in fact, there were even imperial edicts against foreigners learning the spoken and written Chinese language throughout most of the nation’s history. Our dynasty’s majestic virtue has penetrated unto every country under Heaven, and Kings of all nations have offered their costly tribute by land and sea. As your Ambassador can see for himself, we possess all things. I set no value on objects strange or ingenious, and have no use for your country’s manufactures. At the time, it was not difficult to see the rationale behind Emperor Qianlong’s position. In addition to giving birth to classic literature and philosophy including the Confucian Analects, I Ching, Journey to the West, and The Art of War; economic, military, political, and social innovations such as coinage and paper currency, maps, military strategy, advanced navigation techniques, and standard weights and measures; and massive architectural and infrastructure projects including complex irrigation systems, large stone arch bridges, the Forbidden City, the Great Wall, and the Temple of Heaven, among many others; more inventions and scientific advancements first took root in China than any other country on earth. Included among countless examples of such creations and discoveries described in the massive seven-volume, twenty-four book tome, Science and Civilization in China, written by British scientist, historian, and sinologist Joseph Needham (1900-1995) and first published in 1954, are what the Chinese still take pride in as the Four Great Inventions of their civilization: the compass, gunpowder, paper making, and printing. 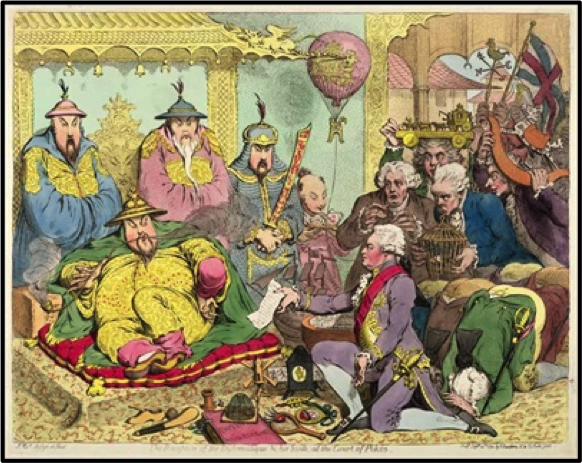 Image: The Reception of the Diplomatique and his Suite at the Court in Pekin by James Gillray (1756-1815). Although many companies tend to implement what they feel is a deliberate strategic approach based on what has worked well in their more developed markets, this has proven ill-suited and problematic, at best, within a market as complex and fast-changing as China is today. 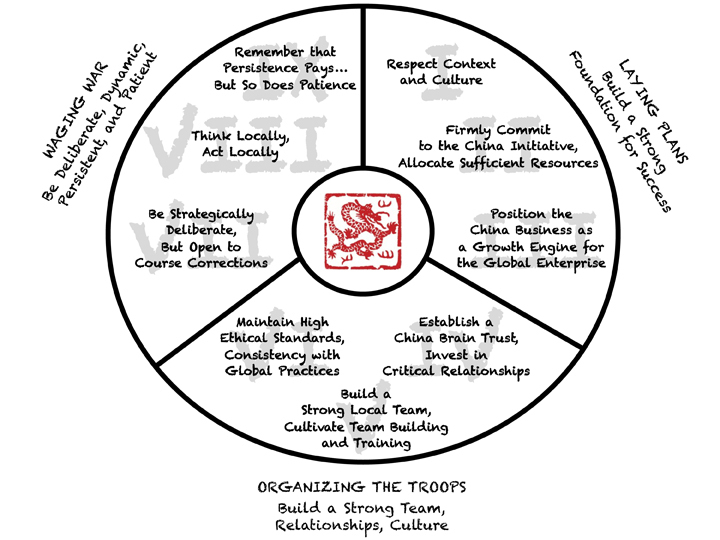 Instead, initiating what we refer to as a fire dragon strategy and its nine underlying tactics will likely prove to be a highly practical, systematic approach in helping companies to achieve meaningful, sustained business success in the world’s fastest-growing, most greatly coveted market. In order to make smart, thoughtful business decisions, it is wise for executives to remember the old adage, knowledge is power. This is especially meaningful in light of better understanding and competing within China’s highly complex, fairly intimidating, and rapidly changing business environment. In many ways, ancient Chinese military general, strategist, and philosopher Sun Tzu’s thoughts on preparing for battle still seem to be prescient and hold relevance for those modern corporate warriors seeking to engage in the China market. 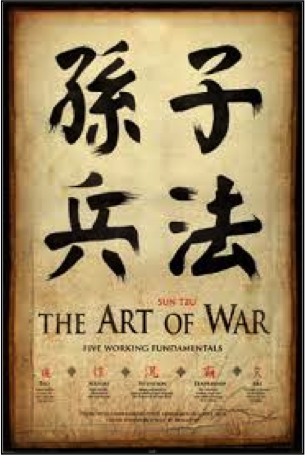 Inspired, in large part, by Sun Tzu’s time-tested approach for military success and what he suggested more than 2,500 years ago as critical areas of primary focus including laying plans, organizing troops, and waging war, our proposed strategic framework applies many of the same essential techniques of planning, organization, and execution to significantly increase a company’s chance of business success in the China market today. Please stay tuned in to future blog posts for more detailed discussions of each tactical area within the fire dragon strategy framework. For those companies operating in China, it is wise to consider the harsh, often painful lessons learned in recent years by others including Apple (labor abuse, unfair customer care policies, and unequal product pricing), Google (control and self-censorship issues), Johnson & Johnson (selling products with old formulations containing potentially harmful ingredients), Kentucky Fried Chicken (lapses in supply chain management that led to selling tainted food), and Yahoo! (relinquishing control of its local business to Alibaba Group in return for equity, but losing all standing in the market in the process), among others. Some of these companies do manage to acknowledge their failures and regain lost ground, but the sts of such institutional distraction, repetitional harm, and wasted resources are usually quite high. Sufficiently Leverage Brand Capital, Company Intelligence, and Institutional Resources. Create as much strategic advantage as possible by adequately leveraging your brand capital, company intelligence, and institutional resources to mitigate risks and ensure a greater chance of success. In China, one of the world’s oldest and richest civilizations, there are many animals and creatures which have become symbols of great cultural significance, but none as enduring or meaningful as the mythical dragon. For thousands of years, the dragon has been widely revered in Chinese classic literature and folklore as the symbolic embodiment of dignity, fertility, prosperity, strength, and wisdom. It was foretold that this legendary creature had the ability to control the forces of nature and, throughout history, many Chinese have believed that close association with the dragon – as with those born in the Year of the Dragon in the twelve-year cycle of the Chinese zodiac calendar, for example – would bring a long life of happiness, good health, and success. Fire, one of the five natural elements (wŭ xíng, 五行) in Chinese philosophy, and its correlating color red, signify warmth, creativity, dynamism, and good fortune. It is no mere coincidence that the annual, festive Chinese lunar new year celebration includes giving red packets filled with gifts of money to friends and family, traditional dragon dances, and a seemingly endless display of fireworks to scare away evil spirits and welcome a rewarding new year. The mythical fire dragon (huŏ lóng, 火龙) is, therefore, an exceptionally auspicious and unique creature indeed. Today, the Chinese nation and its people play a critical, influential role across all major economic, environmental, military, political, social, and technological issues shaping our world in the twenty-first century. With a massive consumer base spending heavily both at home and abroad, China represents a tremendous opportunity for companies seeking growth. But the path to profits is highly complex, fraught with potential pitfalls that are best avoided. The specter of the bold, imposing, and powerful fire dragon looms large as a constant, symbolic reminder of the challenges and risks that lie ahead for individuals and enterprises wishing to enter the China market, but if appreciated and adequately addressed will lead to great success in one’s endeavors.